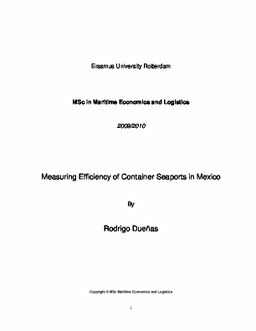 The aim of this study is to determinate whether Mexican seaports operating more efficient are those attracting higher levels of cargo traffic in terms of total throughput. This paper use DEA(Data Enveloped Analysis) which is non-parametric approach commonly used for assessing relatively efficiency on seaports. The model estimates the relatively technical efficiency among principal container ports in Mexico. The study takes into account three inputs (berth length, storage area and number of Cranes) and two outputs (containers throughput and general cargo throughput) for calculating technical efficiency using DEA output oriented in two variants CCR model and BCC model. In addition, the study provides an overview of the port system in Mexico, the Mexican port reform of 1993, the process of containerization and hinterland connectivity.